I was looking at my cute little tomatoes today and discovered that those pesky fire have set up camp right under my tomato plants. I did some research online and found two good solutions. One is diatomaceous eath (DE) which is a powder. The other is a liquid made of compost tea, orange oil and molasses. My plan is to go to the natural gardener this weekend and get their opinion. While I’m there I am also going to talk to them about some more bugs that are destroying my roses and how to keep bugs away from the figs. I know it’s a bit premature, seeing how small fig stick is presently, but my friend Joe wanted me to find out for him as well. As always the natural gardener was a wealth of knowledge. I brought my list of questions and a very nice guy, wish I had gotten his name, had an answer for everything. Fire Ants – Nemotodes. He said these will not only take care of the fire ants, but other destructive pests as well. He said the nemotodes will be a great addition to the vegetable garden. Roses – I forgot my bug that I had collected to bring with me, but it didn’t seem to matter much. 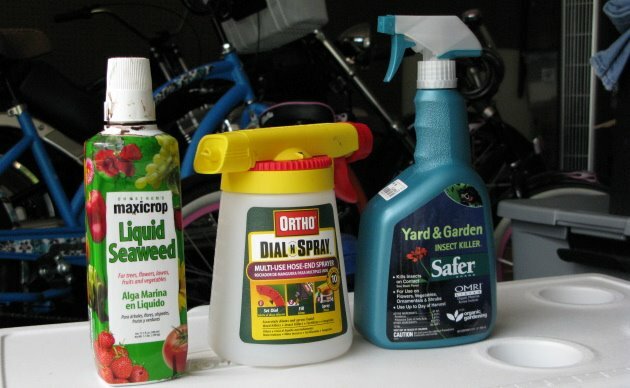 He gave me Safer brand yard and garden insect killer. It is completely organic and they said it will take care of thrips and whatever other bugs I may be seeing. Since I forgot to being the bug with me I looked it up on whatsthatbug.com. It appears that these bugs are katydids. Figs – First of all he said that figs are native to the area, so they have lots of natural defenses. If this isn’t enough, the best solution is garlic spray. He said take an entire bulb of garlic, break up the cloves to get them reacting and put them in water overnight. He said about a bulb per spray bottle is good. The next day spray all over the tree. I asked if this would create a garlic taste in the figs and he said as long as I wash them off before eating there won’t be a problem. Peppers / Liquid Seaweed – I asked him if it was normal for me to see tomatoes but no peppers since I planted them at the same time. He is explained how the root systems are different and it does take peppers longer. We also went into a discussion on watering since I have been juggling between yellow leaves, due to overwatering, and losing flowers due to underwating. He gave me liquid seaweed which keeps the plants from dropping flowers. I purchased an ortho dial & spray which will work for the liquid seaweed and the nemotodes. While I was there I also bagged 3 bags of mulch to supplement the mulch in my veggie garden as well as my daughter’s garden in the back yard. I’m always happy when leaving the natural gardener, even if my wallet is a bit lighter.